THE Gold Coast's skyline is about to push higher following city council approval of a new 88-level tower to rise on the former Iluka site. The $1.2 billion project, proposed by China's Forise Holdings, eclipses the Q1 and Melbourne's Eureka Towers from a high rise living perspective, with the highest apartment sitting at 285 metres. That's 50 metres higher than the Q1's tallest apartment and just one level higher than Eureka's. 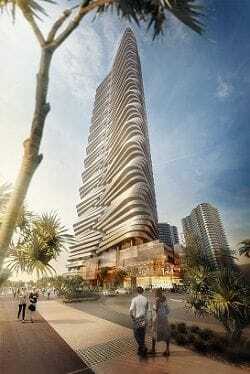 The unnamed building will become the city's tallest tower with a total value rivalling the $970 million Jewel triple-tower project under construction at the southern end of Surfers Paradise. Forise acquired the former Iluka site this year from interests associated with Goldman Sachs for about $65 million. The sale is expected to settle in December. The site was once earmarked by Raptis Group for a major new development in 2007, but faltered along with the company's fortunes a year later. The Iluka building - the Gold Coast's first true high rise - was demolished by receivers in 2013 and has lain dormant ever since. Forise has set a construction date of March next year for the project, which is estimated to take four years to complete. "This building will be the signature tower on the Gold Coast skyline, a genuine world tower for a world city," says Forise spokesman Tony Hickey, who heads Gold Coast law firm Hickey Lawyers. "As you would expect, a development of this magnitude raises a variety of complex challenges during the application process but we have worked through those with council and achieved an outstanding set of outcomes for both the project and the city. "This will be a major economic driver for the city that would not have been possible without the active advocacy of the Mayor who met with Forise a year ago in China and encouraged the group to invest on the Gold Coast." The wave-inspired project, created by the Gold Coast team at DBI Design, is expected to support about 1000 jobs during construction and more than 700 jobs once completed. "Forise is committed to supporting local employment and economic growth and has already engaged the best consultants on the Gold Coast," says Hickey. "Throughout the development of this project, Forise will continue to employ local consultants and Australian building groups." Analysis by consultants Macroplan Dimasi estimates the project could generate 280,000 visitor nights worth annually about $70 million in visitor expenditure to the Gold Coast economy. The 5-star green star certified building, located on a 3494sqm site on the corner of The Esplanade and Trickett Street, will comprise 693 luxury apartments and three separate recreation deck levels and over three podiums. Apart from five-star concierge service for residents, including valet parking, the building will feature a striking exterior LED lighting display that will create the illusion of light falling like rain down the building's façade. Forise, chaired by Xin Wang, also plans to create a signature retail and restaurant precinct within the development, targeting high-end retailers such as Louis Vuitton, Hermes and Prada, as well as Michelin-star restaurant operators. "My brief to the team has been quite simple - to create a world-class and iconic tower which will not only add beauty to the impressive skyline of the Gold Coast but take its place as one of the most outstanding buildings on the skyline of the world," Wang wrote to Mayor Tom Tate in July. Forise wants the project to become its flagship building, one that will 'capture the attention of a global audience'. It plans to spend more than $2 million on public art by US artist Ed Carpenter.